전문분야 • 인내심이 많고 상식이 풍부함. 열정적임.스마트함. 엔토 매니저님! Jane 선생님은 어떤 분이신가요? 박학다식한 상식 여왕 Jane 선생님은 풍부한 주제를 가지고 재미있는 영어 대화를 이끌어 주는 선생님입니다. 인내심이 많고 교육에 대한 열정이 투철해 학생과의 좋은 관계를 위해 굉장히 많은 시간을 할애하시는 선생님입니다. 초중급 학생에게 매우 추천! 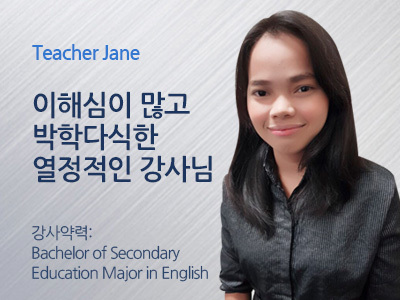 I'm Teacher Jane, a graduate of Bachelor of Secondary Education, major in English. 저는 Jane입니다. 중등교육에서 영어를 전공했습니다. Teaching was never been an option for me. 가르치는 일은 결코 제가 저를 위해 선택한 일은 아니었습니다. When I was little, I dreamed of becoming a doctor, because back then, I believed that I could help many people in need. 제가 어렸을 때, 저는 의사가 되기를 원했습니다. 왜냐하면, 그 당시에 저는 의사가 되면 많은 어려움에 빠진 사람들을 도울 수 있을 것이라고 생각했기 때문입니다. But then everything changed when I entered college. 그러나 대학교에 들어와서 모든 것들이 바뀌었습니다. I realized that being a teacher is far better than any professions. 저는 다른 어떤 직업보다 선생님이 되는 것이 더 좋겠다라고 생각되었습니다. If a doctor could heal wounded men, a teacher could mend an entire generation by becoming a ladder that reaches one's dream. 만약에 의사가 아픈 사람을 치료할 수 있다면, 선생님은 각 개인의 꿈에 이를 수 있는 다리가 되어 전 세대를 도울 수 있을 것이라는 생각이 들었기 때문입니다. Now, teaching is my priority, and I can't imagine a future without it. 지금은 가르치는 것이 저의 최우선 순위이며, 저는 가르치지 않는 저의 모습을 상상할 수 없습니다.